After seven years, corresponding to seven successful electronic issues of Choros International Dance Journal a very fruitful collaboration and dialogue sprung between Greek and international dance scholars (editorial board members, reviewers and contributors). 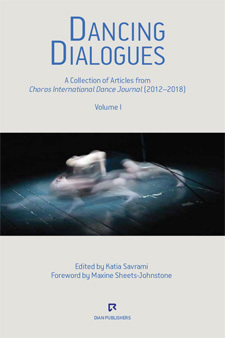 It is in this context that we came up with the idea of publishing an Anthology, in two volumes, in 2019 and in 2020 based on a selection of articles from the 7 issues of Choros International Dance Journal, entitled Dancing Dialogues. Indeed, we believe that these publications can contribute to advancing Dance in both academic and socio-cultural terms. Dancing Dialogues, Anthology from the 7 issues of Choros International Dance Journal, Volume I, 2019, DIAN PUBLISHER. Paperback, pp.288, ISBN 978-960-7222-59-6. Edited by Katia Savrami, Foreword by Maxine Sheets-Johnston. Volume I: SECTION 1, On Theory and History (1.1. Moving in Concert MAXINE SHEETS-JOHNSTONE. 1.2. Odysseus Weeping RAMSAY BURT. 1.3. In Remembrance of Dance Lost GRAHAM McFEE. 1.4. On (Not-) Becoming Repertoire, Re-doing Appropriation in Contemporary Choreography EFROSINI PROTOPAPA. 1.5. Eva Palmer-Sikelianos Dances Aeschylus: The Politics of Historical Reenactment when Staging the Rites of the Past SAMUEL N. DORF. 1.6. Appropriations of Hellenism: A Reconsideration of Early Twentieth-Century American Physical Culture Practices NATALIE ZERVOU. 1.7. The Founding of American Ballet Theatre on the Eve of War, 1939–1944: Depression, Modernity and the Holocaust NINOTCHKA D. BENNAHUM) . SECTION 2, Modes of Research in Dance(2.1. On the Methodology of Practice as Research ROBIN NELSON. 2.2. Explaining a Dream: Writing the Simultaneity of Performance (Practice based Research) KAREN CHRISTOPHER. 2.3. Towards a Methodology for Studying Greek Dance STERIANI TSINTZILONI. 2.4. Demolition: A Destabilizing Force for Transgressing Artistic Disciplines ARIADNE MIKOU. 2.5. Fictional Screendance Typology DIONYSIOS TSAFTARIDIS). Dancing Dialogues, Anthology from the 7 issues of Choros International Dance Journal, Volume II, Forthcoming, 2020, DIAN PUBLISHER. Volume II: SECTION 1 On Dance Politics, Activism and Queerness (1.1. The Act of Making: Dance as Aesthetic ActivismSHERRY B. SHAPIRO. 1.2. Injurious Acts: A Struggle with Sissy in Performance NANDO MESSIAS. 1.3. Think, Talk, Act and Enjoy! On Artistic Interventions for Change EFVA LILJA. 1.4. Trajal Harrell’s Antigone Sr. / Twenty Looks or Paris is Burning at the Judson Church (L): Antigone Voguing on a Catwalk? CHARITINI TSIKOURA. 1.5. Embodying the Crisis: The Body as a Site of Resistance in Post-bailout Greece ΙΟΑΝΝΑ ΤΖΑRΤΖΑΝΙ. 1.6. Taking the Next Step: Dance Advocacy in Greece ANN COOPER ALBRIGHT. SECTION 2 Issues on Dance Education (2.1. Dance Artists in Academia: Developing a BA Course in the Maltese Context JO BUTTERWORTH. 2.2. Dancing from a Distance: International Collaboration in Higher Education via the Internet PAULINE BROOKS. 2.3. Dancing Toward Inclusion: Embedded Assumptions and Innovations in Functional Anatomy PEGGY GOULD. 2.4. Movement, Myths and Metaphors: A Story of the Dance Technique Class and its Demise ERICA STANTON. 2.5. The Ability of Using Symbols and its Contribution to Dance Learning: The Laban Notation System ASPASIA DANIA, MARIA KOUTSOUBA, VASILIKI TYROVOLA).